Students eating breakfast at school. Photo by Faten for Solidarios sin Fronteras. Used with permission. With the acute lack of resources caused by the war in Yemen, a growing number of families are forced but to take their children out of school. Girls are often sent away to marry at ages as young as 13. However, one school in the capital Sana’a found a modest, yet effective, form of relief. 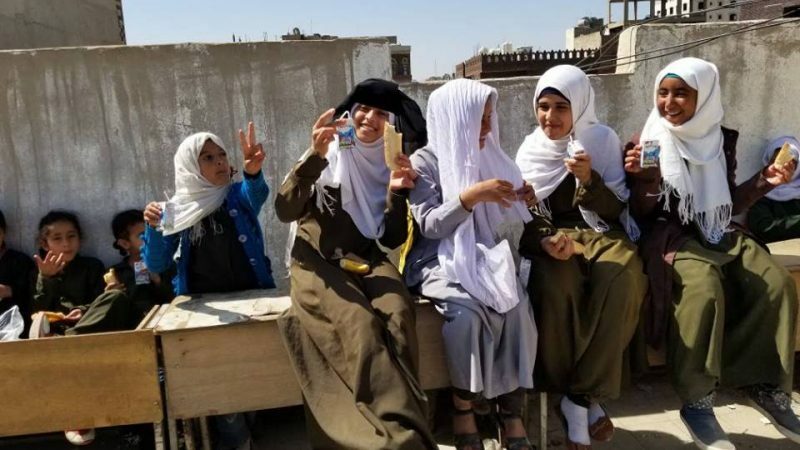 The NGO Solidarios sin Fronteras (based in Spain and Yemen) run almost entirely by volunteers and funded primarily by individual donations — some as small as one euro per month—, has started to provide a complete breakfast for this school’s girl students, who are aged six to 16. Before the project began, one-fifth of them had been absent. Little by little, they started to come back and, since September 2018, all 525 students are regularly attending classes, Solidarios’ founders say. I’ve spoken via Whatsapp with two of the NGO’s founders, Eva, who I had previously met in person some years ago in Barcelona, and Faten, who is in Yemen. They told me about how their project “Breakfasts to educate and protect” came about. They also asked me to not disclose their full names or the name of the school for security concerns. In March, 2018, one of the school’s teachers reached out to Faten about an 8-year-old girl who seemed to grow thinner and more exhausted by the day. Suddenly, she stopped attending school. She had not been the first to quit, but she was the youngest. The teacher talked to the family: they were in extreme financial need and had received offers to marry their daughter. Most of [these girls are] daughters of workers of the textile factory, which was completely destroyed [in the bombings]. The families haven’t [had any] salary for 3 years. How could they cover food expenses? […] The most important thing is that we’re supporting them to complete their education. Their families [are also] happy, as keeping them at school prevents them from staying at home or getting married at such a young age. In March 2018, the United Nations declared the humanitarian crisis in Yemen the worst in the world. With raging unemployment and inflation, 80 percent of the country’s families are in debt and 65 percent struggle to buy food. 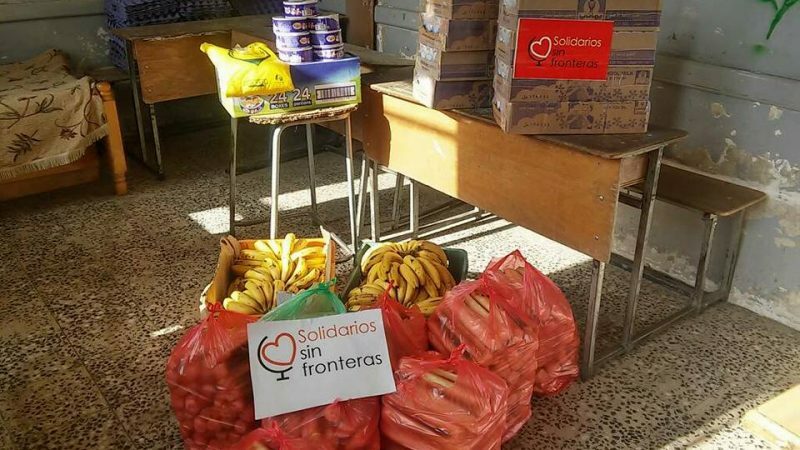 Solidarios sin Fronteras consulted with a pediatrician to design the breakfast’s menu. Faten shops for groceries every morning and a married couple uses her kitchen to prepare, pack and transport the food. During a 45-minute break at work, she rushes to the school to help the teachers distribute the meals. Sometimes, her siblings come to help out, too. This do-it-yourself spirit is true for the organization’s three other programs. With “Food aid for families,” they distribute food packages for vulnerable families in the cities of Sanaa, Aden, Amran, Raydah, Hodeidah, Al Dorihimi, and displaced families from Taiz. “Water for Yemen” maintains water reservoirs in the Amran and Raydah camps for internally displaced persons and “Rebuilding Socotra” provides cement for rebuilding houses and dig wells in the island of Socotra, devastated by hurricanes in 2015. Prepared breakfasts are distributed every morning at the school. Photo by Faten for Solidarios sin Fronteras (Solidarity without Borders). Used with permission. Eva, who has 15 years of experience in international development, could not find any grassroots NGO working in Yemen that she could trust. So she and Faten, along with a third friend Noèlia, decided to create their own that same year. The three women are a volunteer executive team and count with support from trusted volunteers in both countries. Eva and Noèlia, who are based in Spain, take care of fundraising: they rely on social media, radio, the print press and lectures to spread the word about their work and attract contributors. Most people donate online and SSF crowdfunds each project separately. Faten is responsible for administering the ground operations — often from her own house. The three of them make up the executive team and juggle their tasks in the NGO with their daily jobs. They regularly share photographs, videos, and detailed updates on the SSF’s social media pages. They also circulate content to raise awareness about the war in Yemen, in particular, the role of Spain and other countries who supply arms used in the conflict.